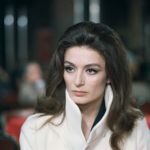 Anouk Aimee is a French film actress, who has appeared in 70 films since 1947, having begun her film career at age 14. In her early years she studied acting and dance besides her regular education. Although the majority of her films were French, she also made a number of films in Spain, Great Britain, Italy and Germany, along with some American productions. Among her films are Federico Fellini’s La Dolce Vita (1960), after which she was considered a “rising star who exploded” onto the film world. She subsequently acted in Fellini’s 8½ (1963), Jacques Demy’s Lola (1961), George Cukor’s Justine (1969), Bernardo Bertolucci’s Tragedy of a Ridiculous Man (1981) and Robert Altman’s Pret a Porter (1994).